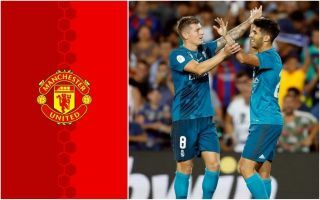 Real Madrid have cleared the way for Manchester United to sign long-term transfer target Sergej Milinkovic-Savic from Lazio. The Serbia international is one of Europe’s most highly-rated young midfielders at the moment, having shown himself to be a stand-out performer in Serie A. United have been linked with him for months both as a potential replacement for Paul Pogba or as an ideal midfield partner to go alongside the Frenchman. Real Madrid have also been linked with Milinkovic-Savic, but Don Balon claim Florentino Perez is no longer pursuing the 23-year-old. This should be great news for United as they continue to look in need of a new signing in midfield to come in and strengthen what has been something of a problem position for the club. Despite being valued at around £100million, Milinkovic-Savic looks worth every penny as he could be a big upgrade on flop summer signing Fred, and be a fine long-term replacement for the ageing Nemanja Matic in the middle of the park.